When you learn that gluten is your body’s enemy, the first thing that brings tears is the thought of giving up bread. No more french baguettes or artisan boules – the kind with a textured look and crunch to its exterior, the inside revealing a soft crumb and spring to its “step”. Your single lady dinner of crostini with good cheese, olives and a glass of wine is gone. And the simple egg sandwich that saved you many times from hangry outbursts – well, people better watch out. I don’t miss many gluten-ful things, and I’m actually thankful for figuring out that years of auto-immune issues were related to gluten. I was forced to explore many “new to me” foods and nourish myself the natural way – with whole grains, vegetables, fruit, lean protein, legumes, nuts, and real dairy. But dang. Sometimes you just want a piece of really good bread. 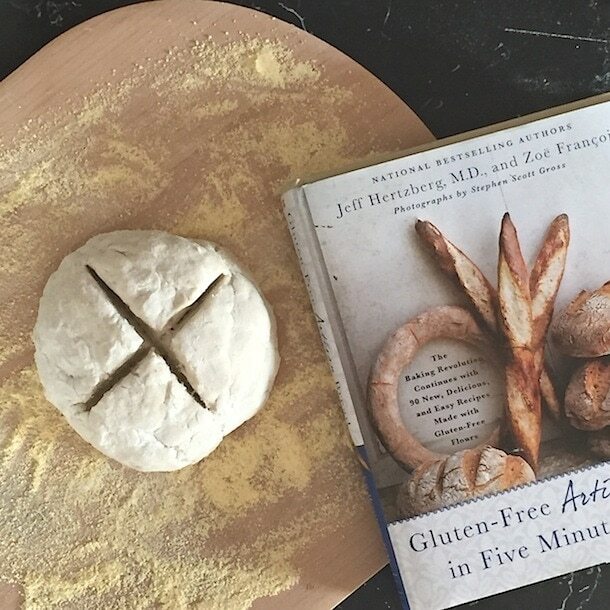 Knowing what brilliance came from Zoë and Jeff’gluten-free pizza dough, I had anxiously been awaiting their Gluten-Free Artisan Bread in Five Minutes a Day book. Living in the same city as this duo and writing a book at the same time, we chatted a little during the process. They put in so many long hours, loaf after loaf tested and retested to bring this brilliant bread technique to those of us who have to avoid gluten. My first loaf (which is the book’s master dough recipe pictured in the two photos above. The pictures following this paragraph are the Whole Grain Loaf.) was a special experience beyond it being gluten-free. It was my first time making any kind of homemade bread. I had watched my grandmother do it, and my mom made the best homemade buns, but I was nervous about getting the process just right. That was my Type A personality coming out in full force, which truth be told was why I didn’t do a ton of cooking before this blog was born. Little did I know that being in the kitchen gave me the freedom to embrace creativity and break away from too much self-judgement. 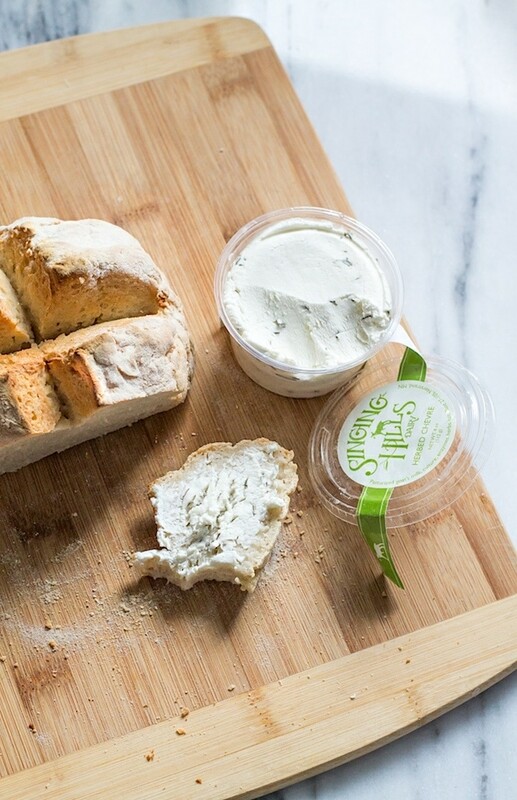 The wonderful thing about Gluten-Free Bread in Five is that it truly simplifies the process. You literally mix the flours & dry yeast, stir in warm water and let the dough do its thing in a warm spot. After that you keep it in the fridge and when you feel like baking a fresh loaf, soft pretzels or a puffy & blistered piece of naan, you get your oven & baking stone smoking hot, no kneading required. Are you pinching yourself hearing these favorites you never thought you’d be able to have again? I’ve made all of those I mentioned above and with each bite I felt like I died and went to heaven. 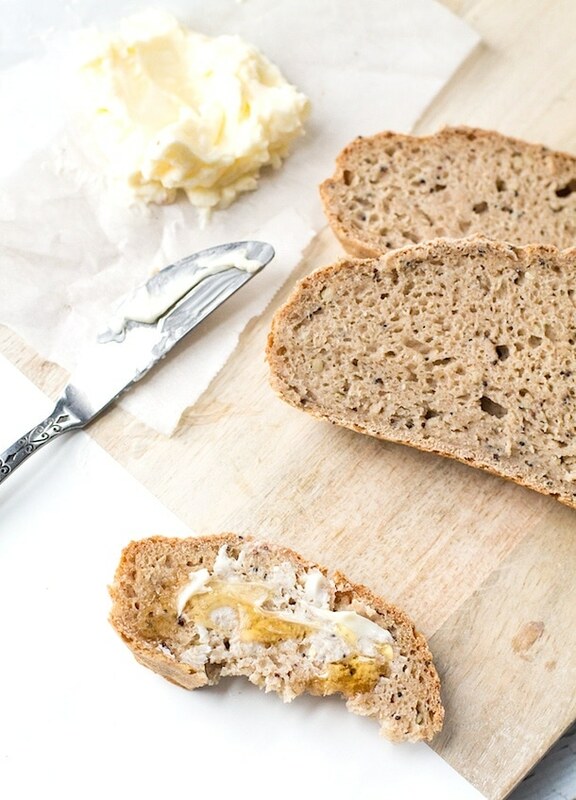 The taste & texture is far better than any gluten-free bread product at the super market. 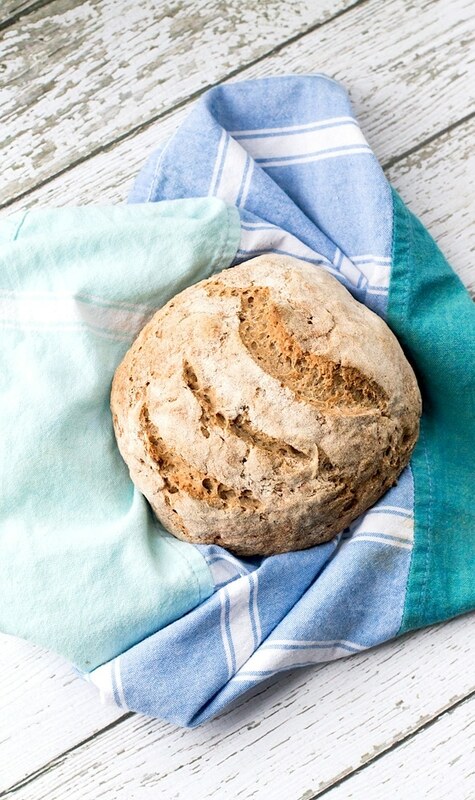 Jeff and Zoë provide all the insight to achieve bread baking success the easy way. You’ll learn about things like why it’s important to have an oven thermometer, 3 different ways to produce the steam that gives your loaves that beautiful, crusty top and what different flours do in gluten-free baking (they did the science experimenting for you!). And as they discuss in the book, the brand of flour you use does matter. 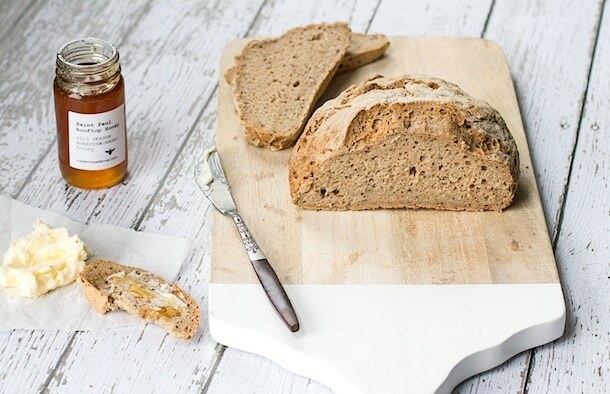 Bob’s Red Mill is their choice when using individual flours to make a gluten-free blend, and mine as well, each one finely ground to produce the lightest loaf and consistency. They have every flour you could ever need and are an amazing resource for all things baking. You can follow along with them on Facebook, Instagram and Twitter as they share great recipes and tips. I’m grateful for their passion in making gluten-free flours accessible and affordable. And now for the giveaway! St. Martin’s Press will be sending the lucky winner a copy of Gluten-Free Artisan Bread in Five Minutes a Day straight to their door. And also special thanks to Bob’s Red Mill for sponsoring this post. The giveaway is open to US residents only and will end at 11:59pm, January 1st, 2015. You’ll find this recipe on page 99 of Gluten-Free Artisan Bread in Five Minutes a Day (which you can buy here) and I added the two seeds for texture and appearance. It is shown as pictures 3-6 in this post. Whisk together the flours, seeds, yeast, salt and sugar in a 5-to-6 quart bowl, or a 5 quart dutch oven, which is what I used. Add the water and mix with a spoon. Cover (not airtight), and allow to rest at room temperature until the dough rises, approximately 2 hours. Don’t be surprised that it doesn’t rise much. This is normal. The dough can be used immediately after the initial rise, though it is easier to handle when cold. Refrigerate it in a lidded (not airtight) container and use over the next 10 days. Or freeze for up to 4 weeks in 1-pound portions and thaw in the refrigerator overnight before using. Pull off a 1-pound (grapefruit size) piece of dough. Place it on a pizza peel prepared with a good amount of cornmeal or rice flour. Quickly shape it into a ball and smooth the surface pressing and smoothing with wet fingers. Cover loosely with plastic wrap and allow to rest for 60 minutes. About 20 minutes into the resting period, preheat a baking stone near the middle of the oven to 450°F, with an empty metal broiler tray on any shelf that won’t interfere with the rising bread. After the bread is rested, make 1/2-inch-deep slashes with a wet serrated bread knife, in a pattern that you like, a cross or crescents. Shimmy loaf onto the hot stone, then quickly pour 1 cup of hot tap water into the boiler tray, and immediately close the oven door. Bake for 45 minutes, or until richly browned and firm. Smaller or larger loaves will require adjustments in resting and baking time. Allow loaf to fully cool on a rack before eating – this is so hard! But it’s essential in getting the best texture. i love their books too Marye! do you have their Artisan Pizza book? so many great ideas and combinations. So much of this post resonates with me, from autoimmune to type A! :) I can’t wait to check out this cookbook. I hope you have a merry Christmas!! 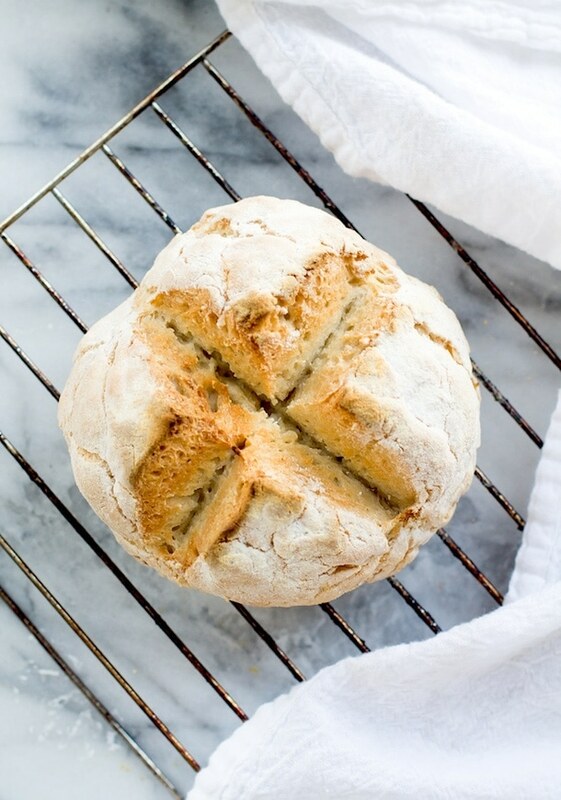 This inspires me to put my fears aside and to try to bake bread for myself! I’ve been lusting after this book for quite a while …. it sounds great! Merry Christmas …. and enjoy breaking bread with those you love. Hi Carly! Yes, you need this book. It’s so amazing. It would make a nice self gift if you don’t win the giveaway. Thanks for stopping by! I just added that book to my wishlist! I am going through an elimination diet after testing positive to eggs, beef and peas. Then further removing gluten and dairy because I still wasn’t feeling great. I have missed bread as most store bought have eggs or egg whites in them. Your photos are gorgeous and I can’t wait to try out this recipe! I am so excited about this. I’ve been doing a gluten free diet for a few weeks now, and I miss real, crusty, fluffy bread like crazy. Cannot WAIT to try this! I haven’t really been feeling any better yet, which is discouraging. I think more experimenting is going to be necessary to find the right balance for me. But I’m hopeful! 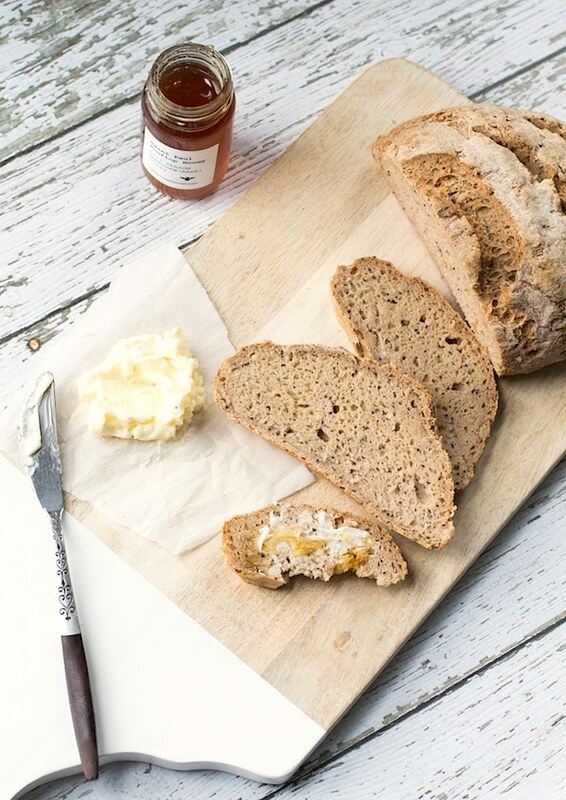 I am so impressed by this beautiful loaf and also completely inspired to try my hand at gluten-free bread soon too! Thanks for your constant inspiration, Amanda! This looks like real bread! Thank you, will try it tomorrow. I don’t have a pizza stone though – would a baking tray work, or maybe a glass casserole dish lid? Hi Lorna! It is delicious. If you don’t have a pizza stone, the other option is to use the heaviest gauge baking sheet or jelly-roll pan that you have. Just know that it will not be as crisp as what is shown above. Do not use a glass casserole lid, as it will burst at this high of heat. i don’t see where to add the sugar in the instructions! I’m assuming you add it with the other solid ingredients, before adding the water but thought i would check to make sure. Thanks! I don’t have their book, yet. Can I sub all purpose gluten free flour for both flours? Hi Amanda, I mixed up a half batch of this last night and it’s honestly a gooey mess. I left it in the fridge to see if that would help but it didn’t seem to. I looked up the recipe on the GF AB 5 minutes a day site, and it lists 6.5 cups flour to 3.75 cups liquid. Is the 4.75 cups liquid in your recipe above a typo perhaps? Hi Lindsey! The recipe you see here is for the Whole Grain Gluten-Free Loaf from the book, which is part GF Mix #1 (which is what you found on their website) and part GF Mix #2. These mixes are different flour blends, the GF Mix #2 being all whole-grain, which is in the book. 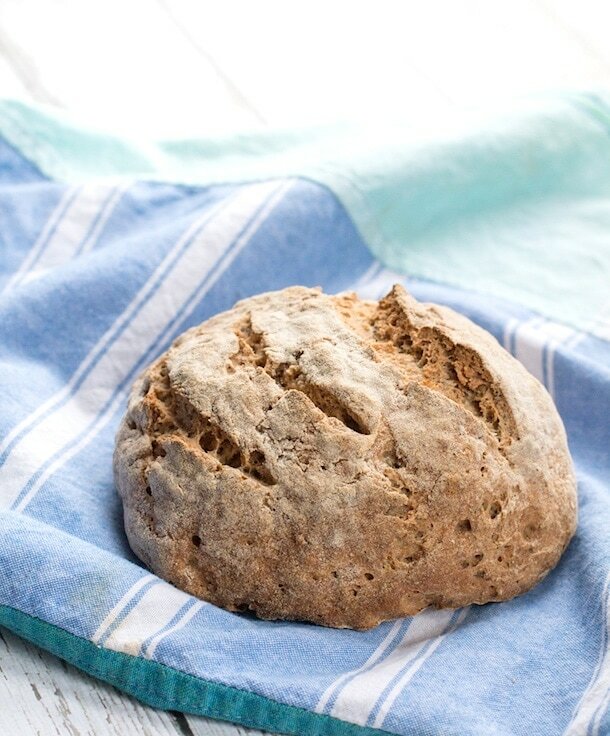 The recipe which I have posted about is for that Whole Grain Loaf, which does actually call for 4.75 cups of liquid because of all the whole grains. So, if you used just the Mix #1 and did not use the other part Mix #2, that would be why it is too much liquid. When both mix 1 & 2 are used as stated above, more liquid is needed so that it is absorbed all of the whole grains. thanks so much for responding so quickly Amanda. I didn’t have any whole grain flour, so that is definitely where I went wrong. Lesson learned! do you think my ‘dough’ is salvageable for anything? Can one substitute honey, maple syrup or black-strap molasses for the raw cane sugar and do you think it would be equal to adding the two extra tablespoons of liquid called for it using brown rice flour instead of the white rice flour? Hi Diana! I’m not sure if that would work, as I haven’t tried it that way. You could ask Zoe, the author of the book. 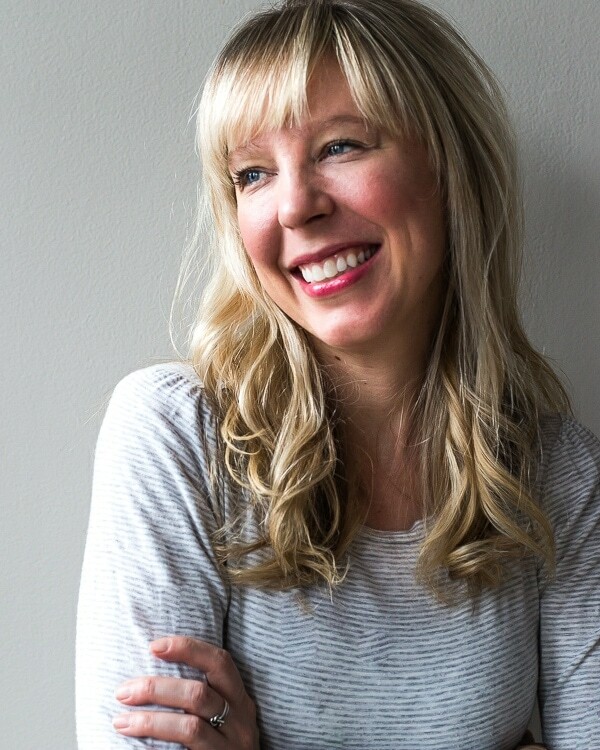 Her website is zoebakes.com — have a great day! I don’t know if you will see this or not as this is an older post but I have a question about the size of the loaves. In the pictures they appear to be a good size but when i made one it turned out to be about the size of a large roll. Which only using a grapefruit sized piece of dough I can understand it wouldn’t be large. My question is, can I make a larger loaf so it can be sliced & used for sandwiches on occasion or is it only meant to be eaten as a side? Hope you see this & thanks for any input you can give me. hi elizabeth! although the pictures make the loaf look big, i would say they are about 5 inches in diameter. i haven’t tried a larger loaf, so you’d have to play around with a longer bake time. I’m trying to figure out which part of this is only five minutes. Although the recipe looks delicious, the title is extremely misleading. The authors call it “Artisan Bread in 5 Minutes” because you make the large batch of dough, pull off pieces of it through out the week for loaves, and have it in the oven in 5 minutes.